Hong Kong's truly unique attractions. Jumbo Kingdom is a world-famous floating restaurant, an internationally renowned tourist attraction and a must place to visit in Hong Kong. Here's how to get there. 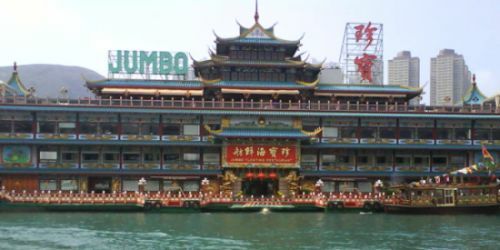 Jumbo Kingdom (click here to view interactive map) is a world-famous floating restaurant, an internationally renowned tourist attraction and a must-visit place in Hong Kong. This place revives a classic Hong Kong dining experience, as the "Typhoon Shelter" seafood meal, is brought up to date now being includes a cafe, conference and banquet facilities, cultural attractions, a cooking academy and exhibits that have transformed it into a theme park on the sea. Visitors can combine the first-class cuisine of the Jumbo Restaurant with a comfortable ride on a new sampan. The restaurant is decorated in the style of an exquisite ancient Chinese imperial palace. This jumbo floating restaurant is located at Aberdeen Harbour in Shum Wan Pier Drive, Wong Chuk Hang, Hong Kong. Opening Hrs: 11:00 - 23:30 (Mon-Sat) / 07:00-23:30 (Sun & Public Holidays). The Hong Kong Floating Restaurant. Getting to the Jumbo floating restaurant in Hong Kong. Take an MTR trains towards Hong Kong station and take Exit D.
Take the Bus 70 from the Exchange Bus Terminus to Aberdeen terminus, cross the highway via subway (pedestrian tunnel), turn right and walk to dock for free boat ride to the floating restaurant. Or, take the Bus 75 from Exchange Square Bus Terminus to Shum Wan Shuttle Ferry pier for the free boat ride. Hey, Jumbo Kingdom is also close to the Ocean Park tourist attractions.